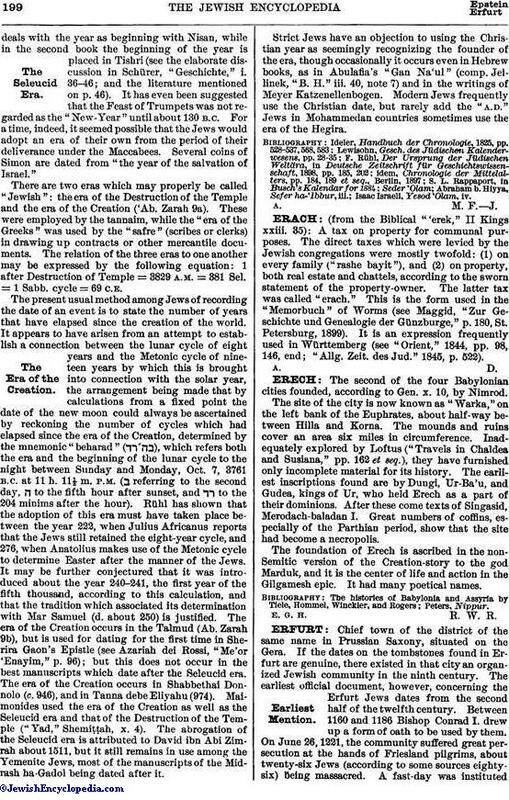 The present usual method among Jews of recording the date of an event is to state the number of years that have elapsed since the creation of the world. It appears to have arisen from an attempt to establish a connection between the lunar cycle of eight years and the Metonic cycle of nineteen years by which this is brought into connection with the solar year, the arrangement being made that by calculations from a fixed point the date of the new moon could always be ascertained by reckoning the number of cycles which had elapsed since the era of the Creation, determined by the mnemonic "beharad" ( ), which refers both the era and the beginning of the lunar cycle to the night between Sunday and Monday, Oct. 7, 3761 B. C. at 11. h. 11⅓ m. P.M (ב referring to the second day, ח to the fifth hour after sunset, and to the 204 minims after the hour). 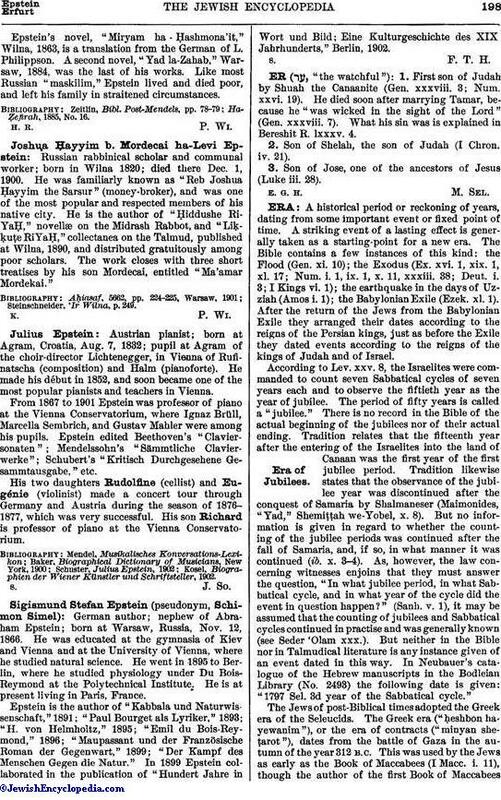 Rühl has shown that the adoption of this era must have taken place between the year 222, when Julius Africanus reports that the Jews still retained the eight-year cycle, and 276, when Anatolius makes use of the Metonic cycle to determine Easter after the manner of the Jews. It may be further conjectured that it was introduced about the year 240-241, the first year of the fifth thousand, according to this calculation, and that the tradition which associated its determination with Mar Samuel (d. about 250) is justified. The era of the Creation occurs in the Talmud (Ab. Zarah 9b), but is used for dating for the first time in Sherira Gaon's Epistle (see Azariah dei Rossi, "Me'or 'Enayim," p. 96); but this does not occur in the best manuscripts which date after the Seleucid era. The era of the Creation occurs in Shabbethai Donnolo (c. 946), and in Tanna debe Eliyahu (974). Maimonides used the era of the Creation as well as the Seleucid era and that of the Destruction of the Temple ("Yad," Shemiṭṭah, x. 4). The abrogation of the Seleucid era is attributed to David ibn Abi Zimrah about 1511, but it still remains in use among the Yemenite Jews, most of the manuscripts of the Midrash ha-Gadol being dated after it.